On the right side of your Bugcutter board is the menu, the mission control center for your board. The menu is where you can manage members, control settings, and enable Power-Ups. Let’s look at some of the menu’s tastiest items. Board Members – Invite, remove, and manage board membership permissions. 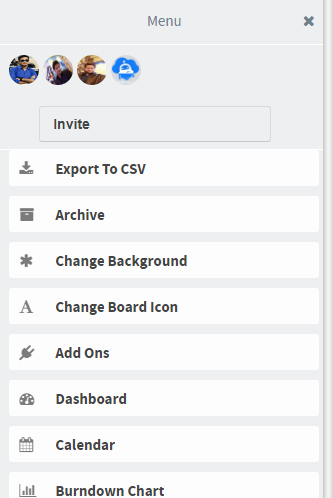 Click “Invite” to add people to a board, and invite them by their email or Bugcutter username. Team members are automatically surfaced to save you some clicks. Change Background – Add some personality to your boards! Your Bugcutter board comes with a default Bugcutter blue background, but just click “Change Background” and voila! There are additional colors and thousands of beautiful photos from which to choose. Give each board a unique feel. Who says productivity shouldn’t be fun, too?